Click image or heading for a larger image in a new window. Before Photo looking South from Living room. Before Photo looking West from Living room. One more Before Photo looking North from the Living room. Let the Demo begin! 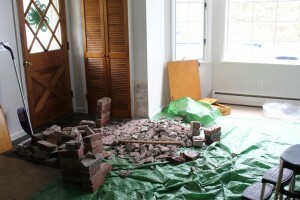 Here we are removing the brick knee wall that served as a divider for the entry way. 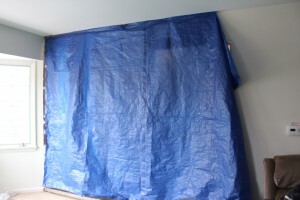 Lets tarp off the main construction area in an effort to reduce contaminates. 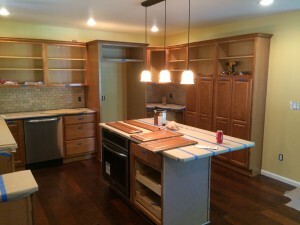 Cabinets, Flooring and Drywall removal on all walls has been completed! 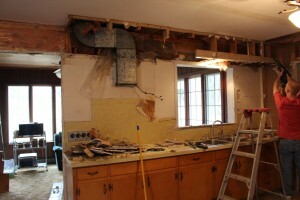 This is the portion of the Northern Kitchen Load Bearing Wall that will be removed. 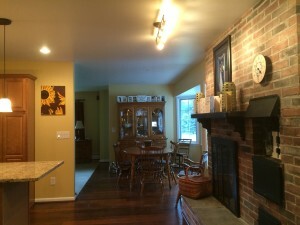 It was decided that the Kitchen did not have enough Natural Lighting and that removal of this portion of the wall would not only let more of that Natural Light in but that it would also open up everything and improve the flow. 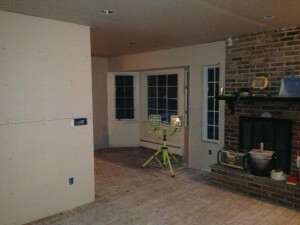 Looking into the Kitchen at the Bearing Wall from the soon to be Dining Area. 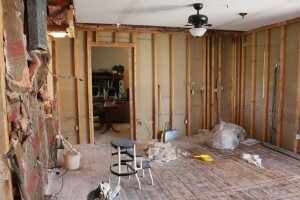 Now that most all (the Old Ceiling Drywall is still intact) the Demo has been completed, it is time to begin the reconstruction aspect of a redesigned layout. 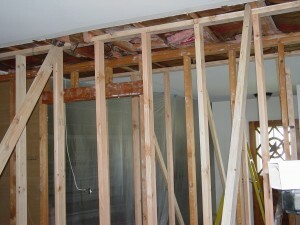 Here the Temporary Support Walls are constructed to support the removal of the Bearing Wall and the insertion of a Bearing Support Beam that will reside, hidden above the Ceiling. 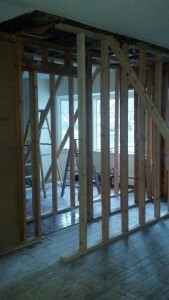 Another view of the Temporary Supports and Bearing Wall that will come out. Load Bearing Beam all snuggly installed. A different view of the Load Bearing LVL Beam installed. You will notice that when the Framing was done, the Joists were butted instead of the more normal practice of a ‘Sistering’. 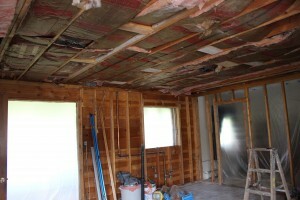 The last remnants of the Ceiling Drywall have been removed. 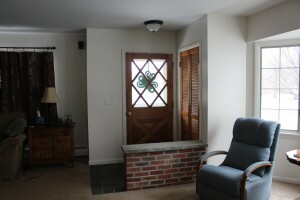 The next step is to close off the existing doorway to the bedroom in the West Wall. Once the rough framing is completed, we are ready to reconfigure the Mechanical’s, ie; Rough Electrical and Rough Plumbing. 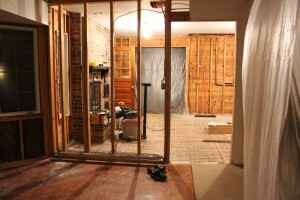 The Rough Mechanical’s have all been installed, the doorway to the Bedroom has been closed off. The Insulation has been upgraded with all new materials for a total of 12″ of Insulation for an industry recommended value of R-38. 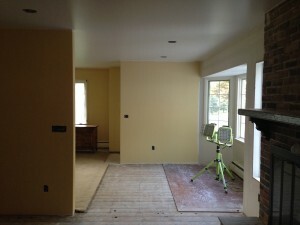 The intermediate Phase of the Job is ready to commence, Drywall. 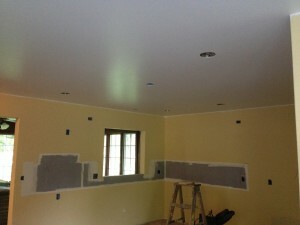 Here the Bedroom side of the West wall has been hung with Drywall and the Kitchen Ceiling is hung, you can see the Recessed Lighting and the Surface Mount Lighting for the Island in this View as well. In this image you will notice an Electrical Box quite high. This particular box will serve as half of a switched outlet for the purpose of the Under Cabinet Lighting. If you look real close, you will see the Low Voltage Wire that will be used to feed the Low Voltage Under Cabinet Lights. 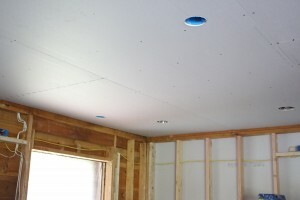 Now that the Ceiling Drywall has been hung the Walls can be boarded. 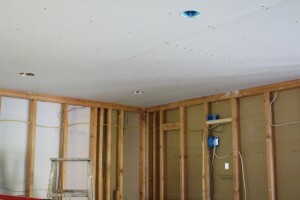 All Drywall has been hung. The Blue portion you see is a Tile Backer designed specifically for the Installation of the Tile Back Splash that will rise from the Granite Counter-top to the Bottom of the Upper Cabinets. 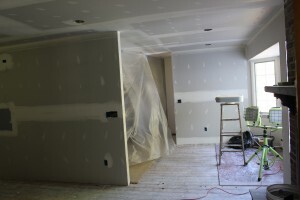 Installed Drywall looking Northward towards the New Dining Area. 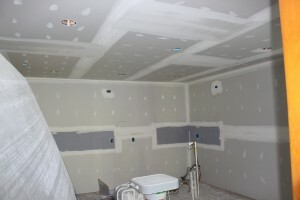 The Finishing aspect of the Drywall Phase is well under way. The darker gray areas of the Finishing tells you that the Compound is still wet. 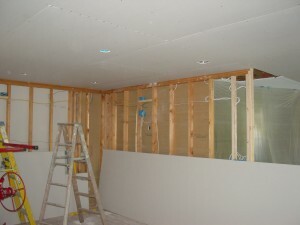 Another view of the Finishing stage of the Drywall process. 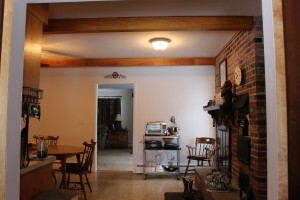 This view looks Northward into the Dining Area. 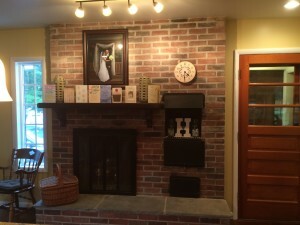 Constructed is the new wall that replaces the old Brick Knee wall. 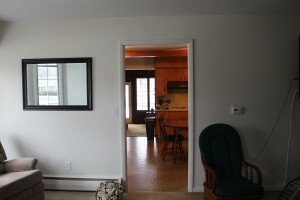 This will delineate the entryway from the rest of the living area. As well as serve as the backdrop for the China Cabinet. 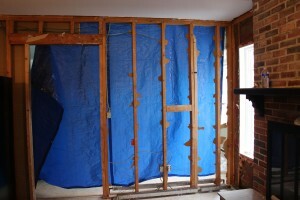 Also, notice the plastic barrier to help contain contaminants from spreading throughout the rest of the home. while containing all of the dust is nearly impossible, all good faith efforts are made. This includes a ‘Sally Port’ made of said plastic where possible. 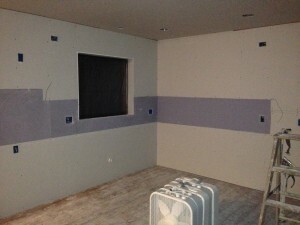 After the Drywall has been Finished, the initial Painting is done. The Ceiling has been Finish Coated and the Primer and First Coat of Finish Paint is applied. 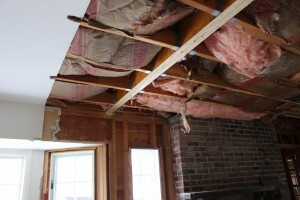 Due to the removal of the Wall, one rather large continuous Ceiling was created. This made painting it a bit of a challenging proposition. We are Proud to say that it came out flawlessly! 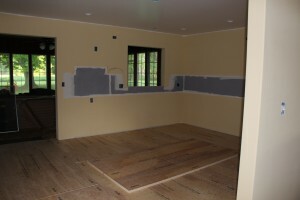 Here we need to cover the Tongue and Groove Planking with Quarter Inch Plywood for the facilitation of the Engineered Hardwood Flooring that will be Installed. 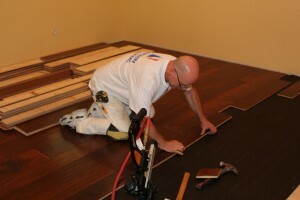 The Installation of the Engineered Flooring is shown in progress here. 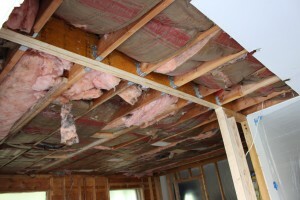 A #15 Felt Paper is used as a Vapor Barrier and to prevent squeaking between the wood surfaces. 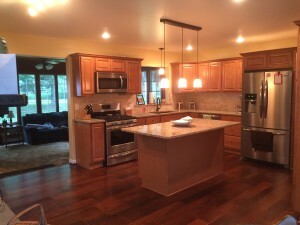 The Flooring selected came in vary widths as well as the standard varying lengths. 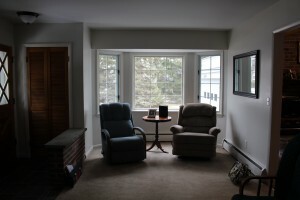 The Homeowner feels this is one of the best aspects of the Job. The Floor really does look sharp! 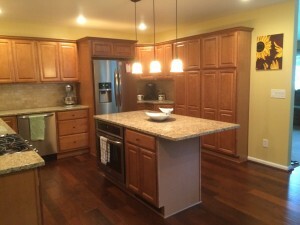 Now that the Flooring has been Installed and Protected with Cardboard, It is time to bring the Cabinets indoors to get them acclimated to their installed surroundings. 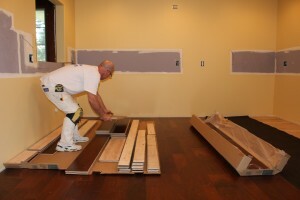 Fortunately this job is large enough that most all of cabinetry can be brought in and kept out of the way of the installation area. The Cabinet Installation can now begin. 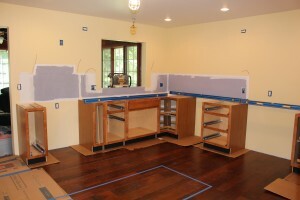 However, before we begin affixing the Cabinetry, there was some concern about the spacing of the Island. 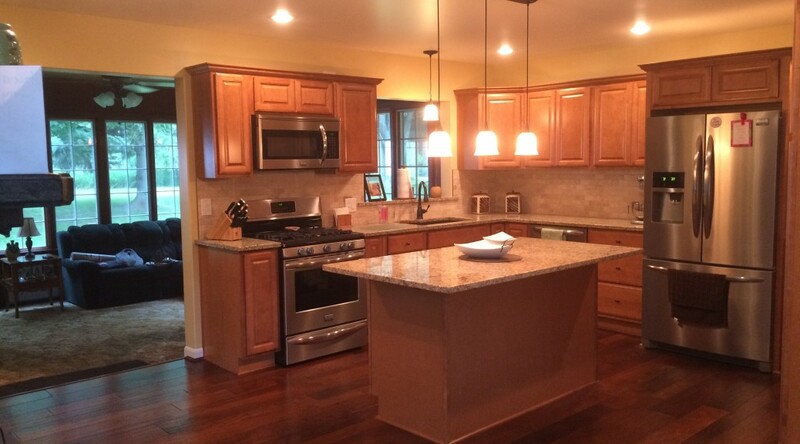 To address this concern, we temporarily set the floor cabinetry in place and taped an outline of the Island Counter-top on the floor to get a better sense of the spacing involved. As it so happens, the design was done nicely and there is no need to adjust anything! 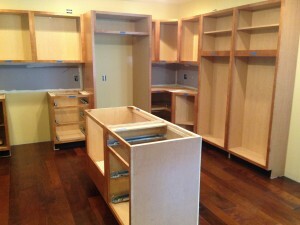 The Cabinetry Installation is going smoothly. 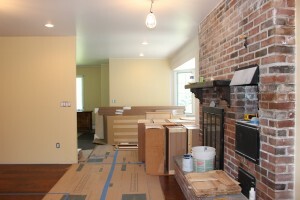 Everything is Square, Level and Plumb! 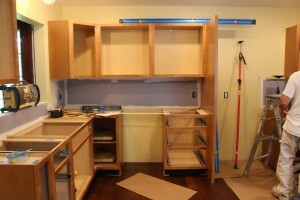 A lot of guys will tell you that the upper Cabinets should be installed first. 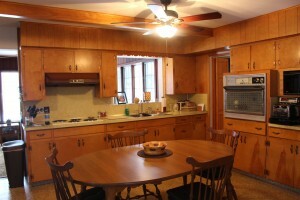 In all reality the Cabinetry needs to installed hand in hand. This means that the uppers and lowers need to be installed ‘together’, especially when you are doing a ‘horseshoe’ installation. Everything has to line up perfectly! 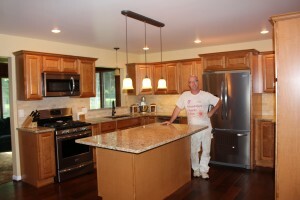 Next is to Install the Wall Oven and Dishwasher so that the Granite Counter-tops can be put in. While were doing this, we might as well Install the Microwave Oven. Another aspect that should be mentioned is that of the small Granite Counter-top to the right of the Refrigerator opening. The Refrigerator is of a depth greater than the Counter-tops, thus it extends outward making the installation of a single piece Counter-top impossible. 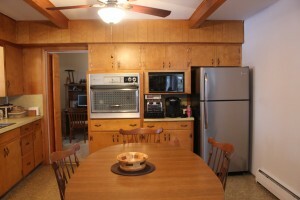 To facilitate a single piece being installed there, we will remove the right hand Wood Panel that encapsulates the Refrigerator and reinstall once the Counter-top has been installed. 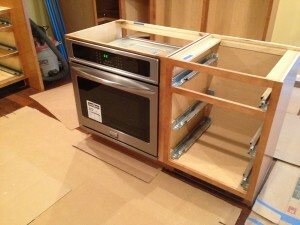 Wall Oven Installed and tested! The factory coatings have been burned off and it is really ready to use. We’re ready for the Granite! 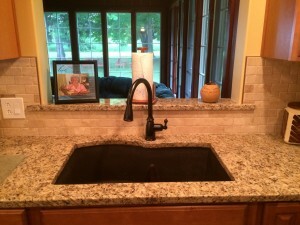 The Granite Counter-tops are in! The Tile Back Splash has been Installed! 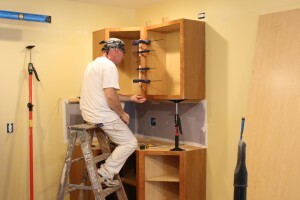 Here we are Installing the Cabinet Doors and Drawers along with the Pulls. A View of the Eastern vantage. Northward looking towards the new Dining Area.